More, more! Faster, faster! It’s an easy trap to fall into: If only we work more or work faster, surely our results will improve, we tell ourselves. In fact, 89% of marketers are logging into work outside of their normal working hours. You probably know that the more-more-faster-faster approach isn’t working. The number of B2B content marketers who see their efforts as effective fell 8% between 2015 and 2016. I suspect that those content marketers are missing the Agile marketing boat. The good news is that anyone can get on board that boat any time. Unfortunately, few are doing so. Only 11% of content marketers report using Agile marketing compared with 63% of marketers overall. As the content marketing waters get turbulent, Agile marketing may give your team just what it needs to stay seaworthy. In the generic sense, “agile” means “nimble.” Agile with a capital “a” refers to a methodology invented by software developers. The concept of Agile marketing may seem foreign if you’ve never seen it in action, but it’s easy to understand. Here’s how it works. For starters, your marketing team agrees on a list of priorities. Based on those priorities, you decide which tasks – including content marketing tasks – are most important. The team agrees to focus on those tasks that it can expect to accomplish during the next “sprint” (typically somewhere between one week and one month) – and it puts all other tasks on hold (on the “backlog”). A sprint is a set period during which team members aim to complete a set amount of high-priority work that’s connected to a long-term plan. Teams work through one sprint after another, reassessing priorities each time. When someone brings you a new request during a sprint, you may stop and address it only if it’s more important than what you’ve committed to. Otherwise, you assign it to a future sprint and return to your priorities. An Agile approach enables you to become more effective without working more. You may get more done – or you may not. The point is that you’re more likely to get the right things done. Why are marketers reluctant to try Agile methods? We don’t know how to do content marketing. Our current approach to marketing is working well enough. Management doesn’t see the value of content marketing. We don’t have time or bandwidth to start creating content. People aren’t willing to try a new approach. We don’t have the right tools to implement content marketing. We don’t have a champion to lead content marketing for our team. Many brands are still trying to catch up with early adopters of content marketing – those forward-thinking marketers who didn’t let little things like complacency or a lack of knowledge stand in their way. Let’s use the lessons we learned during the rise of content marketing to ride this Agile wave a little better. Adopting an Agile approach has the same game-changing potential to launch organizations into a new phase of marketing excellence. Agile teams make small, strategic plans rather than huge plans. They adjust, observe, and adapt based on data. They are more likely to hit their targets – and to stay in sync with evolving business opportunities – than are teams that invest enormous amounts of time and resources in large projects. Agile marketing teams put foundational Agile principles to work on marketing-related initiatives. Since these principles were created for software development, they sometimes clash with the realities of modern marketing. Fortunately, the Agile methodology calls for improving and adapting the methodology itself, so it’s appropriate for us as content marketers to experiment and come up with variations that work for our unique situations. Simply getting faster isn’t likely to do content creators much good. If your writers were suddenly able to type twice as fast, you wouldn’t instantly double your leads. While it’s important for modern marketing teams to respond to market changes in as close to real time as possible, we must balance that need for speed with audience expectations for quality, relevance, and meaning in our content. In my experience, Agile marketing helps content marketing teams find that balance. Agile marketing helps you maintain alignment between day-to-day content production and the content strategy that drives it. It’s easy to dismiss marketing plans that span dozens of pages and try to plan marketing initiatives months (or years) in the future. If we create content strategies that are similarly far-sighted and inflexible, we risk recreating a waterfall approach to content. 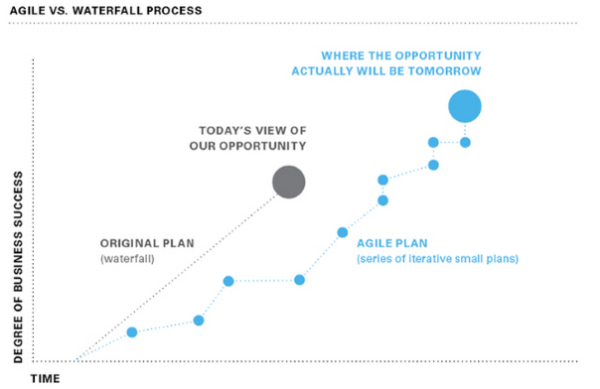 A waterfall approach requires a huge amount of planning in preparation for a big release. Sometimes this approach yields a correspondingly big impact, but there’s also the risk of an even bigger failure. A waterfall approach can sever content marketing ties to the audience; we go into our bubble to make a huge amount of content. By the time we’re ready to deliver that content, our customers’ interests and concerns – or the channels we had planned to use – might have changed. For example, we might draft a content marketing strategy that calls for unleashing a bunch of content that helps marketers get the most out of Facebook – perhaps a good strategy based on today’s view of our opportunity (the gray dot on the chart above). But by the time we’ve got dozens of pieces of content ready to go, Facebook may have changed its algorithm in a way that renders our advice obsolete. If, instead, we released a few pieces of content, measured our audience’s reaction, and then repeated that process – making a series of small evolving plans (represented by the small blue dots above), perhaps dedicating one sprint to each – we would learn about changes as they happen. Armed with these unfolding insights, we could continually adjust our strategy to more accurately target tomorrow’s opportunities (the big blue dot). Identify shifts in our audience’s needs. Create content experiments to help us connect with those needs as they shift. Track which experiments succeed and fail so that we can repeat successes and abandon failures. The goal of Agile content marketing is to create a system that enables us to incorporate new information and emerging innovations into our marketing more rapidly than quarterly or yearly plans allow. Perhaps most importantly, Agile methods support rapid adaptation in a strategic, balanced way. Agile teams may be fast, but they aren’t chaotic. Choices are considered; decisions are not reactive. Agile marketing in general, and Agile content marketing in particular, can help us pilot our teams through the choppy seas of disruption without capsizing. If content marketing is descending into the trough of disillusionment, we need to be piloting the most nimble ship possible to navigate the rougher waters. By adopting Agile marketing, we give ourselves the best possible chance of sailing through. I believe that many of those marketers who, as Joe predicts, will achieve “some of the greatest success stories of our time” will do so, in part, due to Agile methods. Are you part of the 11% of content marketers who are using Agile methodologies today? If not, what’s keeping you from joining their ranks? All aboard! 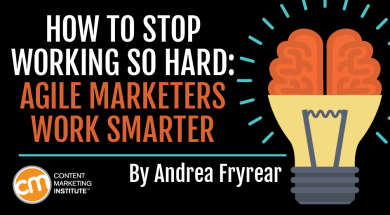 Want more on working smarter when it comes to your content? Sign up for our Content Strategy for Marketers weekly email newsletter, which features exclusive insights from CMI’s Chief Strategy Officer, Robert Rose. If you’re like many other marketers we meet, you’ll come to look forward to his thoughts every Saturday.